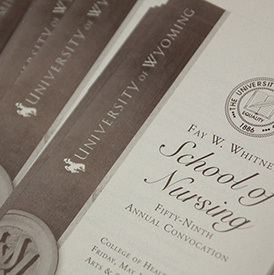 The Fay W. Whitney School of Nursing Convocation is a ceremony specifically for nursing, whereas the UW Commencement ceremonies include graduates across the various colleges/disciplines at the university. Students anticipating graduation in May or August have the option of participating/walking in either or both ceremonies. We encourage our graduating students to participate in each ceremony as they are each unique and special. Graduation is a time of celebration and recognition of your accomplishments. Nursing Convocation is a smaller and more intimate ceremony and is in addition to the UW Commencement ceremonies. We recognize students graduating from each of our nursing programs, BSN [Basic BSN, BRAND, BSN Completion (ReNEW, RN-BSN)], MS [Nurse Educator, Nurse Leader], and DNP [Family Nurse Practitioner, Psychiatric Mental Health Nurse Practitioner], by reading information about them that they have written which includes plans for after graduation. At the same time that we recognize our graduates, we also recognize and acknowledge those who are important in their lives…families and friends. We have a guest speaker who shares words of wisdom. Nursing awards are presented along with some other recognitions. What NOT to take into ceremony: Graduates, do not bring coats, purses, other possessions into ceremony. Please leave those items with family/friends. No later than 1:30 p.m., head upstairs to the second floor for preparation for the processional. Staircases to the second floor are accessed from the main lobby outside of the A&S Auditorium. To your left or right, head up either of the two staircases to the second floor hallway. You will find a School of Nursing table there with Reader Cards needed for the ceremony as well as programs for the ceremony. Pick up your card/program and follow signs to join your group designation. Line up for processional according to staff directions on the second floor hallway. Ceremony starts promptly at 2:00 p.m.